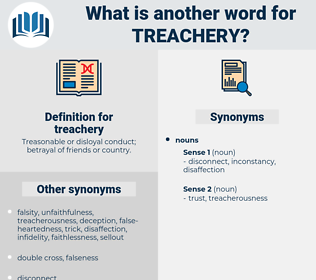 What is another word for treachery? 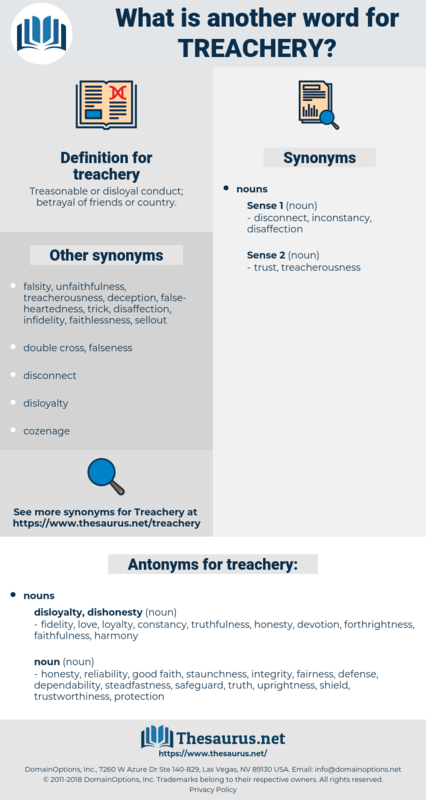 Treasonable or disloyal conduct; betrayal of friends or country. deceit, cheating, trickery, deception, infidelity, traitor, sell-out, cheat. fidelity, love, loyalty, constancy, truthfulness, honesty, devotion, forthrightness, faithfulness, harmony. fairness, reliability, safeguard, staunchness, shield, good faith, uprightness, dependability, protection, integrity, truth, steadfastness, defense, trustworthiness. This last act of treachery, coming after what had happened during the night, and from the very men to whom I had been so kind, was too much for me. Who was ever guilty of such an act of treachery as setting fire to the barn at Dunvegan?